...interfaces...more confusing and complex than I thought they would be"160. One statistic that supports his perception is that the 13,000 keystrokes used in a week-long lunar mission are matched by a Shuttle crew in a 58-hour flight161. Another aspect of the "working for the computer" problem is that steps normally done by computers using preprogrammed functions are done manually on the Shuttle. The reconfiguration of PASS from the ascent redundant set to the on-orbit groupings has to be done by the crew, a process taking several minutes and needing to be reversed before descent. Aaron acknowledges that the computer interfaces are too close to machine level, but points out that management "would not buy" simple automatic reconfiguration schemes. Even if they had, there is no computer memory to store such utilities. Tied to the computer memory problem is the fact that many functions  have to be displayed together on a screen because of the fact that such displays are "memory hungry." As a result, many screens are so crowded that reading them quickly is difficult, the process being further affected by the blandness and primitive nature of any graphics available. 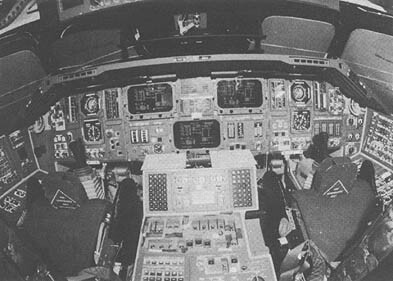 Astronaut Vance Brand claimed that after initial confusion, several hours with simulators makes things easier to find; he makes a point of checking his entries on the input line before pressing the execute key162. Young does that as well, but for additional reasons: The keyboard buffer is so small that entering data too quickly causes some to be lost, and he wants to check whether he is accessing the right screen display with the proper keyboard. This latter concern arises because there are only two keyboards for the three forward CRTs. Since both keyboards can be assigned to the same screen, two CRTs may not be currently set up for input. Even if the two keyboards are assigned to different screens, one CRT is left without capability for immediate crew input. Astronaut Henry Hartsfield termed this situation "prone to error"163. Since flying the Shuttle is in many ways flying the Shuttle computers (they provide the active flight control, guidance and navigation, systems management, and payload functions), the astronauts are interested in making suggestions for improving the computer system. Most revolve around more automation, more user friendliness, more color, better graphics, and more functions, such as adding a return-to-launch-site (RTLS) abort with two engines out in addition to the present version with only one engine out164. Each of these enhancements is tied to increasing memory. IBM proposed a new version of the Shuttle computers with 256K of memory and software compatibility with the existing system. Johnson Space Center began testing these AP-101F computers in 1985, with the first operational use projected for the resumption of Shuttle missions in 1988. In the meantime, the astronauts themselves pioneered efforts to use small computers to add functions and back up the primary systems. Early flights used a Hewlett-Packard HP-41C programmable calculator to determine ground-station availability, as well as carry a limited version of the calculations for time-to-retrofire. Beginning with STS-9 in December, 1983, a Grid Systems Compass portable microcomputer with graphics capabilities was carried to display ground stations and to provide functions impractical on the primary computers. Mission Specialist Terry Hart, responsible for programming the HP-41Cs, said that placing the mission documentation on the computer was also being considered165. ITEM: This selects a specific function displayed on a CRT. For example, if the astronaut wishes to perform a faction numbered 32 on the screen, he or she presses ITEM, 3, 2, EXEC. OPS: This, plus a four-digit number, selects the operational sequence and major mode desired by the crew. For instance, to choose the first major mode of the ascent software, OPS, 1, 1, 0, 1, and PRO is entered. SPEC: This key, plus appropriate digits and PRO, selects a specialist faction or display function screen. Each OPS has associated with it a number of primary screens that reflect what is happening in the software. The ascent program has a vertical path graphic, for instance. Additionally, special functions can be called from SPEC displays that are overlaid on the primary screens when called. On-orbit, and several other OPS, have a "GPC Memory" display that can be used to read or write to individual memory locations. It cannot be called from either the ascent or descent OPS. Display function screens are just that: used to show various data such as fuel cell levels, but with no crew functions. To return to the primary screen that was on the CRT before the SPEC or DISP call, the RESUME key is used. CLEAR: Each time this key is depressed, one character is deleted from the input line on the CRT accessed. This enables an astronaut to erase an error if it is caught before EXEC or PRO is depressed. "+" : This sign can be used as a delimiter around numeric data or between a series of function selections.